Squerb, creator of the multi-dimensional opinion graph, has announced the launch of its public beta on the web, and the development of apps for iOS and Android. The platform allows users to share their opinions on a variety of topics, from movies and celebrities to large corporations, restaurants and much more. Instead of relying solely on “Like” buttons or 1-5 star review scores, the Squerb platform aims to combine all opinions and comments into a single visual graph. With Squerb, users find a topic they’d like to rate, and can rate multiple aspects of that product. For example, when rating a movie, users can break down the movie to its plot, acting, directing and more, rating each individual portion of the film. 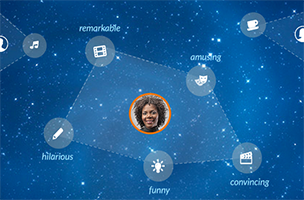 Users can add tags and comments to each Squerb graph, and will earn points on their profile for participating. “For brand marketers, Squerb provides the most developed expression yet of ‘permission marketing’, combining the power of ‘likes’, pins, retweets, comments and 5-star ratings into a single visual graph. Squerb is to be a user-driven platform, where users share their opinions with companies and brands at their discretion, creating a wholly unique kind of engagement with customers. Squerb data makes it immediately clear what aspects of your business merited positive feedback, and which received more negative feedback,” said Squerb founder and CEO Chris Biscoe. Squerb will launch on iOS and Android in the coming weeks. The company also offers an API for embedding Squerb opinion graphs into existing websites. More information on the platform is available on the company’s website.